People often cook up a variety of healthy ingredients only to wrap them in a flour tortilla. Tortillas may be delicious but they aren’t exactly nutritious. If you’re trying to stay away from carbs or gluten, this style of wrap is definitely off the menu. Luckily, there are many alternatives. An easy fix is to forgo the wrap altogether. After all, who says your “wrap” even really needs a wrap? Full of fiber and vitamins C and E, the green pepper is an underutilized resource. Add its slightly sweet taste and crispy texture to the mix and there is no reason to resist the green pepper. 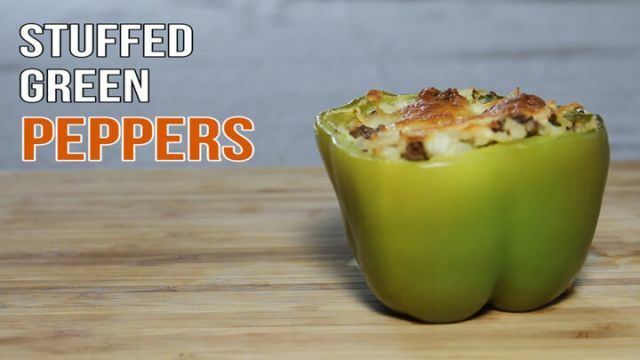 This video uses sausage and brown rice but your peppers can really be stuffed with whatever you like. Try this recipe out and then modify to your particular taste. Enjoy! 2. Slice tops off peppers, remove the insides and dice pepper tops. 3. Dice onion and saute with pepper tops in 1 teaspoon olive oil until until soft. Remove from pan. 4. Add 1 teaspoon olive oil to pan and saute sausage until it is well browned. 5. Add onion and peppers back into the pan. 6. Mix in herbs, salt and pepper. 7. Add Parmesan and cooked rice and mix everything together. 8. Place peppers in a greased baking dish and spoon mixture into them until they are full. 9. Top with mozzarella and bake at 375°F for 30 minutes. Hey Buddy!, I found this information for you: "WATCH: Delicious Stuffed Green Peppers". Here is the website link: https://www.thealternativedaily.com/watch-delicious-stuffed-green-peppers-recipe-video/. Thank you.